Every year we do a special episode as a live performance. This year Sage and Savant travel to the San Francisco Earthquake. While many of our episodes are science fiction with bits of history tossed in, we want to cover as much about the earthquake as possible (in a 30 minute show). So, our live show this year is filled with pieces drawn from historical accounts. Here are the resources we used to detail the events of April 18, 1906. 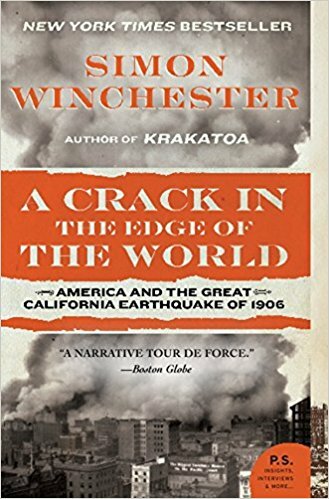 One of our sources is the incredible book A Crack in the Edge of the World: America and the Great California Earthquake of 1906 by Simon Winchester. He includes details and seismograph readings detailing the duration and timing of the quake and various aftershocks. A number of charming personal accounts, Officer Walsh in particular, are from this book. We also relied heavily on The Virtual Museum of the City of San Francisco. 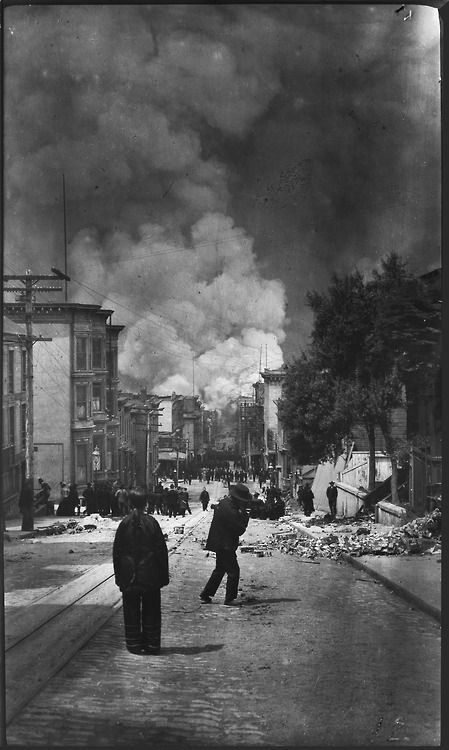 They have an exhibit on The Great 1906 Earthquake and Fire with hundreds of photos and eye witness accounts. 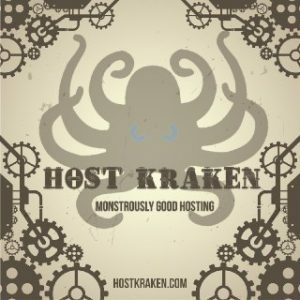 Many of the events in this live episode are directly taken from these live accounts. With very few exceptions, the location of the events mentioned take place at or near where the characters are located. So, if you know San Francisco, you can follow along with their story. 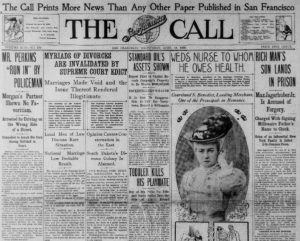 The headlines are taken from the April 18 edition of The San Francisco Call, a paper at the time. You can read the edition we quote online. The duration of the quake is from the USGS, which states. At 5:12 AM local time, on April 18, 1906, a foreshock occurred with sufficient force to be felt widely throughout the San Francisco Bay area. The great earthquake broke loose some 20 to 25 seconds later, with an epicenter in the Pacific Ocean just 2 miles west of San Francisco. Within 30 seconds of the start of the main rupture, very strong shaking had swept throughout the entire San Francisco Bay Area, and lasted some 45 to 60 seconds. Google searches also came up with additional photographs, most especially those by Arnold Genthe. Pinterest also has a vast collection of images from the earthquake. Many of the people included in the story, from Enrico Caruso and his conductor Alfred Hertz, to Police Officer Harry Walsh and Arnold Genthe, are actual people who experienced the quake and lived to tell their stories. There were so many stories, we could only include a small portion. The Jesse Brown Cook scrapbooks documenting San Francisco history and law enforcement at The Bancroft Library is well worth a visit if you have the time and inclination. There are 39 albums containing roughly 8000 photographic prints which include images from Chinatown during the period. Fire Chief Engineer Dennis T. Sullivan, mentioned in the show, was mortally wounded when the dome of the California Theater crashed through the fire stations he was living. We wanted to include a bit about Ansel Adams (who broke his nose during the quake), but he was only four at the time. The episode does not go into much detail about the fire, which lasted three days. Nor do we discuss the military, who were authorized to “kill any and all persons found engaged in Looting or in the Commission of Any Other Crime.” While the fires burned the city was under marshal law. 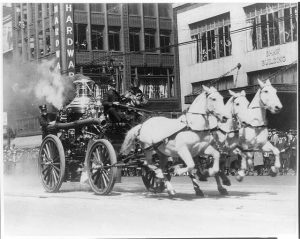 The horses had been a remarkable success since the day in 1863 when they had first seen fire service. To meet the unusual demands and standards required by the Fire Department, a special breed had been developed which was a cross between the great Percheron mares and the English Trotter stallions. They were placed in service when four years old and often served to the age of twenty-four years, after which they were retired to a farm near Martinez. With the advent of motorized equipment however, the end of their usefulness was drawing near. On July 11, 1912, a unique contest was conducted in the presence of Chief Murphy, the Fire Commissioners, the Fire Committee of the Board of Supervisors, and a large attending crowd. A newly designed motor drawn apparatus, the Nott Motor Engine, was to be pitted against the finest horse drawn rig in the Department. The object of the contest was to determine the swiftest and most efficient of the two. The start of the race was from Second Avenue & Clement Street, the old house of Twenty-six Engine. At the sound of the gong the horses leaped into their collars and charged out the door, smoke already belching from the steamer. The driver of the Nott Motor Engine cranked his machine and was quickly in pursuit. His objective was the hydrant at Thirteenth and Lake Streets. He made it in 2 minutes and 20 seconds and the crew had water out the nozzle in a total elapsed time of 3 minutes and 40 seconds. The foam flecked horses drew up to their hydrant at Eleventh and Lake in 3 minutes and 55 seconds, with water flowing in 5 minutes and 6 seconds. Everyone knew what the results meant. The days of the horses had passed, and after this time none were purchased for Fire Department use.